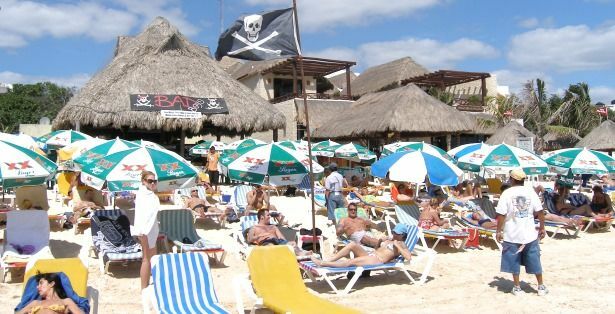 There are lots of expats from the United States living and working in Playa del Carmen and all along the Riviera Maya, ourselves included. If you are one of them and you are anything like us, about this time you might start to feel a little homesick. With the 4th of July almost upon us, we can't help but remember the backyard BBQs, block parties and spectacular fireworks displays that we all enjoyed during our years NOB...north of the border...and start looking for a fun way to celebrate our own Independence Day with like-minded gringos. While you re unlikely to find any fireworks being set off this year, there are a couple of great parties going on that will sure to be a big draw this 4th of July. 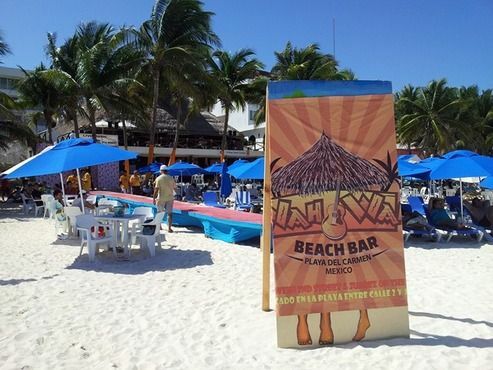 Wah Wah Beach Bar will have it´s annual 4th of July party with bar specials running all day starting at 10:00am. Enjoy ice cold Dos Equis, Sol, Tecate Light, Indio, and Superior bottles for just 20 mn, one dollar draft beers (Sol and Dos Equis Amber) and one dollar tequilla shots!!! The kitchen will be putting out a huge All American Buffet with a Mexican flair: Hamburgers, hot dogs, chili, french fries and onion rings PLUS a whole roasted pig served with tortillas, onions and fresh salsas. There will be a nacho bar and a variety of salads and sides. The buffet will be available from 2:00pm to 7:00pm. All you can eat for just 120 mn per person! Live music will begin at 3:00pm with two of Playa del Carmen´s best bands. The NASTY BASTARDS BAND and RADIO ZERO will alternate sets from 3:00pm to 10:00pm! Come listen to all your favorite music from classic rock of the 70´s and 80's right up to hits of the present day! Finally....as if that weren´t enough...a 200 peso bar credit will be given out to the best All American Outfit of the day. The winner will be announced at 8:00pm. Wah Wah Beach Bar is a favorite with families and is VERY kid friendly. If you are living in Playa or just visiting the area with your family Wah Wah is the place to go to meet people and let the kids make some new friends. Wah Wah is located on the beach just south of Calle 2. Not to be outdone, Bad Boys Beach Bar will be hosting their own 4th of July beach bash with live music starting at 3:00pm with RUBBER SOUL followed by The BAD BOYS BAND and special guest musicians on stage from 5:00pm - 10:00pm. There will be a pig roasted in banana leaves served with salad and fresh rolls. Guests are asked to bring a favorite side dish to share, perhaps a favorite American style potato salad, coleslaw or apple pie or whatever makes your 4th of July complete! Bad Boys is located on the beach just south of Calle 4. Just look for the pirate flag. Looking for laugh this 4th of July? Maybe you would like to have a good time AND give back to the community? 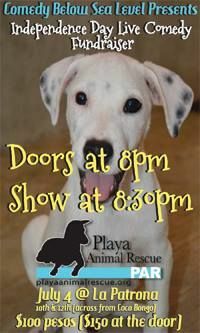 Craig Norton and the cast of characters from Comedy Below Sea Level will be hosting their first Independence Day Fundraiser Mattress Sale Blowout and Comedy Show to benefit PAR Playa Animal Rescue. Comedy Below Sea Level has produced a first rate comedy show every Wednesday at 8pm in Playa del Carmen since September 2011. They have hosted comedians from the Unites States and Canada for small tours through Cancun, Puerto Morelos, Playa del Carmen, Puerto Aventuras, and Akumal. Comedy Below Sea Level was also chosen to host this year's kick-off party for the 2013 Akumal Comedy Festival. The show will be at La Patrona (Av. 10 at Calle 12 across from Coco Bongo) and begins at 8:30pm sharp. Tickets are available at the door for 150 mn but seating in VERY limited to advance reservations (100 mn) are strongly suggested. All proceeds from the event will go to Playa Animal Rescue to help purchase essential blood testing equipment. *No mattresses will actually be sold at this hilarious event. A late addition for the listing just in from our friends at Lol Ha Restaurant! 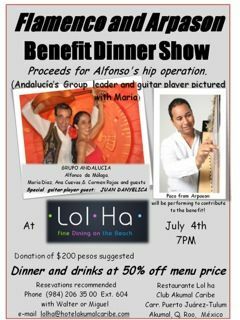 Alfonso, of Akumal's popular Flamenco group, ANDALUCIA, is in need of surgery to repair a painful broken hip. The procedure is expensive and the folks at Lol Ha have stepped up to host a fabulous 4th of July fiesta and fundraiser to help support him in is time of need. All food and drink will be half price and all proceeds from the party will go toward Alfonso's surgery fund. A donation of 200 mn is also encouraged. Arpason will be providing musical entertainment as well as Alfonso's fellow musicians from ANDALUCIA. The Flamenco and Arpason Benefit Dinner Show starts at 7pm and reservations are strongly encouraged. Lol Ha Restaurant is located on the beach on the main bay in Akumal. For more reservations and additional information, email lolha@hotelakumalcaribe.com or call 984-206-3500 ext. 604. 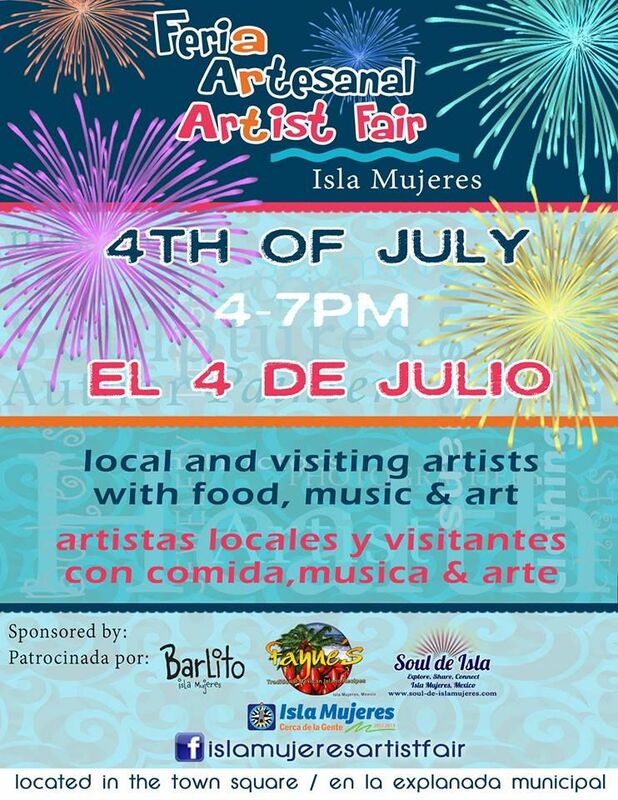 If you happen to lucky enough to be on Isla Mujeres for the 4th of July, you will be able to enjoy the monthly Isla Mujeres Artist Fair in the zocalo! Here, local and visiting artists gather each month to share their talents with the residents and visitors of Isla Mujeres. Any person whose work shows exceptional creative ability or skill is invited to participate. This is a wonderful showcase for individuals who create, write, perform, paint, draw, sculpt, sketch, bake, teach, photograph, etc. In October 2011, Barlito began hosting an Artist Series in front of their bakery & market café on the corner of Hidalgo & Abasolo. This series has since turned into an Island event. With the support of the Municipal Government & the Office of Tourism, the Isla Mujeres Artist Fair is now held in the Zocolo on the first Thursday of every month. Barlito is thrilled to have partnered up with Faynes and Soul de Isla to create a spectacular event for the visitors and people of Isla to personally meet and interact with the artists that are inspired by our beautiful Island. Dozens of local and visiting artists and vendors will be on hand offering local food and a wide variety of arts, crafts, jewelry, musical entertainment and more! The event runs from 4:00pm - 7:00pm and should be fun for the whole family!